Following a moving Prayer Meeting for National Reconciliation on September 8, 2017, Pope Francis paused at the Cross of Reconciliation in Parque de los Fundadores of Villavicencio. The President of the Republic of Colombia, Juan Manuel Santos Calderón, about 400 children and a group of indigenous people joined the Holy Father. The children accompanied him to the Cross while a choir performed a traditional song. The monument contains the number of victims of violence that has shaken the nation in recent decades. 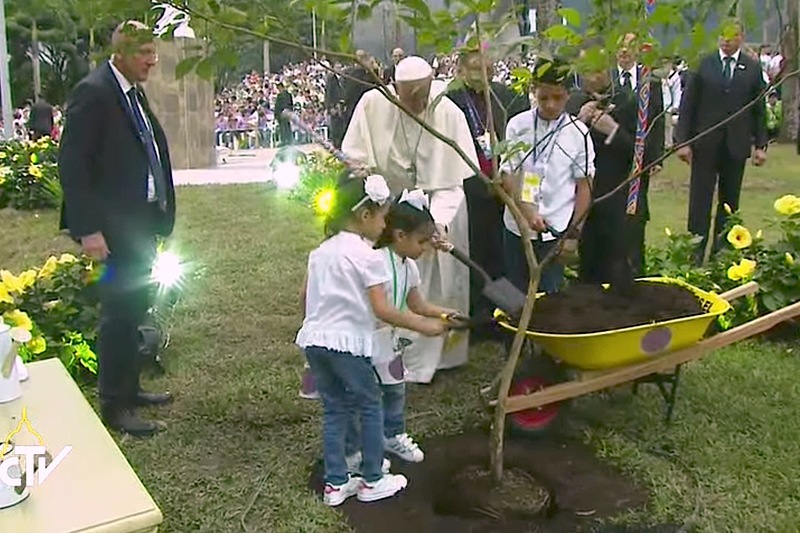 After the ringing of military silence and a brief moment of silent prayer, Pope Francis planted a tree as a symbol of renewed life. Pope to Colombians: "like Moses, I am standing on sacred ground"